To celebrate International Women’s Day, we are profiling the brilliant female leaders at Anicca Digital. 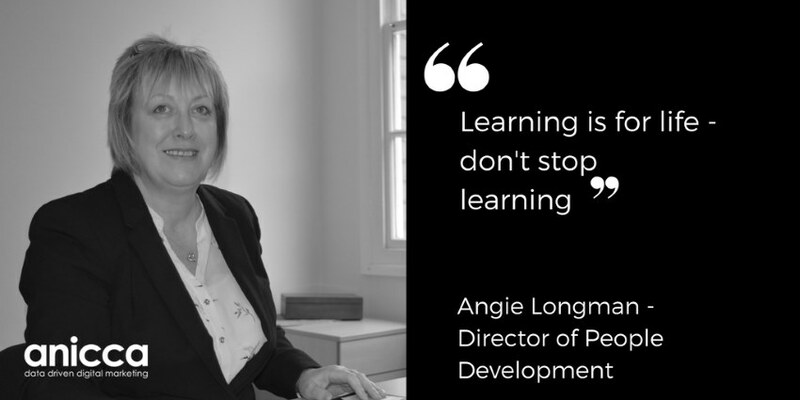 We talk to our Director of People Development, Angie Longman who believes that learning is for life and that you should never stop learning! When I left school, due to poor career advice, I didn’t have the qualifications I needed to achieve my ambition of being a sign writer, so I started out as an office junior and after working for a few companies, I worked my way up to a buyer. I then had my son and took a career break. Afterwards, I joined the Next Directory as an online order clerk and progressed my way to be a team leader. This role was the catalyst and sparked my interest in people development. After working for a few global companies, I then joined Creare to lead their web operations team. I originally joined Anicca Digital as the Client Services Manager and then progressed to Director of People Development. I am a firm believer in making things happen. I love working with people, different kinds of people from all walks of life. I find it incredibly rewarding to see people I have mentored over the years developing. I worked hard for this company and my then MD rewarded me by allowing me the opportunity to be the proud owner of my Porsche Caymen. The company enjoyed rapid growth and I played an instrumental role in growing the web operations team in both numbers of people and revenue. I believe that learning does not stop when you leave school or university, it’s the start! Learning is for life and I’m still learning. If you want something, find out what you need to achieve it and go out get it, make it happen, don’t wait to be asked or shown.